The cooking utensil "Spoon Colander" that can be used to fry and scoop, is a product that embodies the Marna's concept of "Continuously making a high quality daily goods". This is the company's consistent concept regarding manufacturing, and it can also be inferred from the "body brush" (selection Vol.4) which has been chosen in the past JIDA design museum selection. 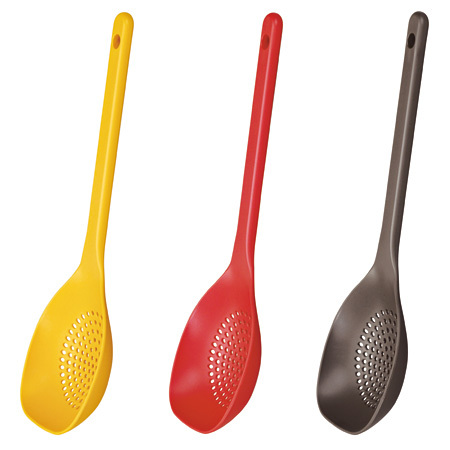 The spoon colander gives refreshing colors to the otherwise metallic or colorless cooking utensils, and directs a fun kitchen life. The color variations are yellow, red and brown, which are easy to match the taste of the dining rooms and other interiors. Furthermore, since it is made from Nylon 66, it has a very gentle feel to it and will also not damage pots and pans treated with fluorine resin. For a long time, Marna, the manufacturer of general household products founded in 1872, has been producing things which are very close to our daily lives such as body care, house care, kitchen utensils, and the consistent attitude will never stop improving the quality of life.